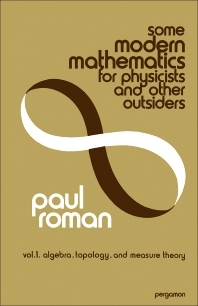 Some Modern Mathematics for Physicists and Other Outsiders: An Introduction to Algebra, Topology, and Functional Analysis, Volume 1 focuses on the operations, principles, methodologies, and approaches employed in algebra, topology, and functional analysis. The publication first offers information on sets, maps, and algebraic composition laws and systems. Discussions focus on morphisms of algebraic systems, sequences and families, cardinal numbers, ordered sets and maps, equivalence relations and maps, composite functions and inverses, operations with sets, and relations in sets. The text then ponders on special algebraic systems, topological spaces, and topological spaces with special properties. Topics include complete metric spaces, compact spaces, separable and connected spaces, homeomorphism and isometry, convergence, continuity, general structure of topological spaces, rings and fields, linear spaces, linear algebras, and nonassociative algebras. The book elaborates on the theory of integration and measure spaces, including measurable spaces, general properties of the integral, and measureable functions. The publication is a valuable reference for theoretical physicists, research engineers, and scientists who are concerned with structural problems.